The Lady Runners this week made their debut in the recent NJCAA Division I polls, entering at No. 20 in the nation. Despite having lost numerous games to inclement weather, AC’s ladies have put together a 13-5 record thus far. In addition, the Lady Roadrunners are ranked No. 4 in the nation in overall hitting with the team batting at a .412 clip. Brette Kohring is tied for 4th in the country with a .579 average, and Nikki Whitehead is ranked No. 22 with an average of .515. The camp is for players ages 12-18 and will focus on the fundamentals of fielding, hitting and base running. Instructors will include AC coaches Mark and Barbi Mattson, who led the 2014 Lady Runners to the NJCAA Division I national championship, and members of the current Lady Roadrunner team. Campers are asked to bring their own equipment. The camp will run from 5-9 p.m. The cost for the camp is $55, and the deadline to register is Nov. 15. To view the registration form, visit the Angelina College Athletics website at angelina.prestosports.com. AC Lady Runner Rachel Agnello,Emilee Cernosek and Jessica Husband will be helping out at the mini-camp on Nov. 16 for students age 12-18 to improve fundamentals. The season may have ended in May, but Angelina College’s 2017-2018 Lady Roadrunner softball team continues to earn recognition for its work in the classroom. On Tuesday, Oct. 2, the Lady Runners were named to the 2017-2018 Easton/National Fastpitch Coaches Association Academic Teams after compiling a team-wide 3.230 grade-point average for the fall 2017 and spring 2018 semesters. AC ranked 13th among the National Junior College Athletics Association’s Division I programs and 30th among all two-year schools. In addition, six Lady Roadrunners earned their places on the Easton/NFCA Scholar Athletes list: Emilee Cernosek and Riley Garrett from Katy; Morgan Conner from Groveton; Megan Kirchhoff from Spring; Taylor Lenggenhager from Austin; and Nikki Whitehead from Kingwood. Angelina College softball coaches are Mark and Barbi Mattson. 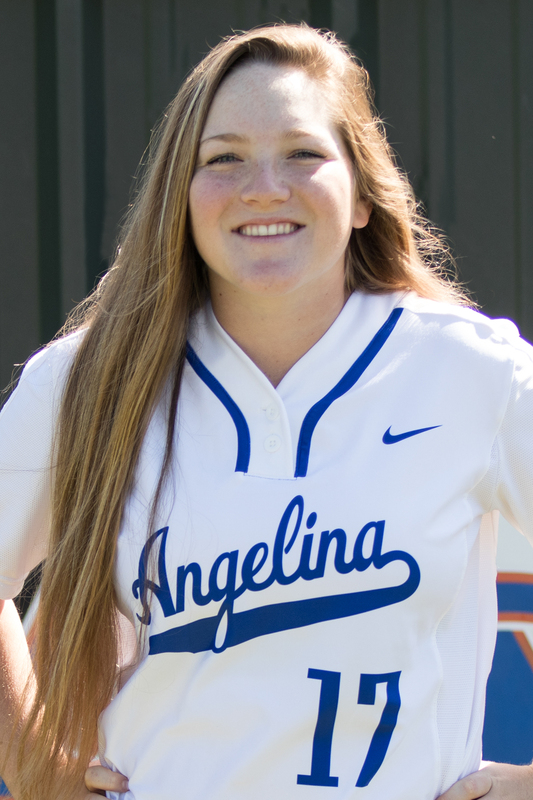 Four members of the Angelina College Lady Roadrunner softball team landed on the Region XIV All-Conference list with freshman Emilee Cernosek earning First-Team honors and teammates Shelby Mixon, Nikki Whitehead and Jessica Husband making the Second-Team list. Cernosek, a freshman from Katy, leads the team in home runs with 13. The lefty-swinging second baseman is batting at a .432 clip with a whopping .744 slugging percentage and a team-leading 48 RBI. Her 67 hits led the team. Freshman pitcher Mixon of Woodville leads the staff with a 17-8 record, a 3.87 ERA and 146.2 innings pitched. Mixon has recorded 79 strikeouts, also first among AC pitchers. Kingwood Park product Whitehead, hitting .423 with 33 RBI and a .469 on-base percentage, was third on the team with 55 hits. Husband, also from Kingwood Park, is batting .372 from the leadoff spot. She boasts an on-base percentage of .434 and is second on the team with 58 hits. AC’s Lady Roadrunner pitcher Leigh Luker drives one in during the game against Bossier Parish. The game was held at Larry Phillips Family Sports Complex April 25. The Bossier Parish Community College Lady Cavalier softball team boasts leaders in nearly every statistical category in the Region XIV East Zone, and on Wednesday, April 24, the team proved the numbers do not lie. The Lady Cavs swept the Angelina College Lady Roadrunners 9-4 and 13-2 at the Larry Phillips Family Sports Complex with BPCC starting pitcher Elisa Favela spinning no-hit ball for six innings before allowing a single to AC’s Taylor Lenggenhager and a two-run homer from Jessica Husband. Favela entered Wednesday sporting a 2.32 ERA in conference play. Favela and teammate Chelsea Fagan also have combined for 52 homers this season, and both went deep Wednesday against the Lady Roadrunners. Despite the losses, the Lady Runners still cling to fourth place in the conference standings with a 27-18, 15-11 record. AC celebrated Sophomore Night following the games. Playing in their final home games were Kiriany Hornberger, Morgan Conner, Ashley Hallmark, Leigh Luker, Reygan White and Taylor Lenggenhager. Riley Garrett, AC Lady Roadrunner No. 5, comes in for a run ahead of the ball during the game against Navarro College Wednesday, March 14. 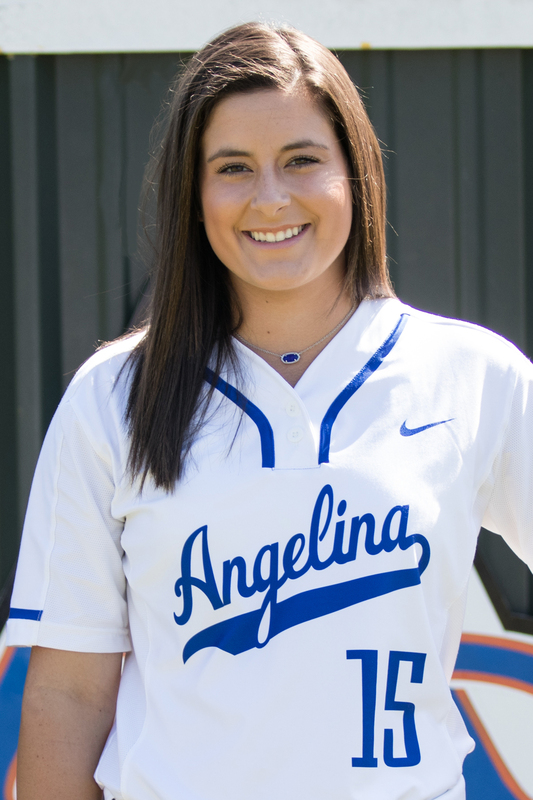 If the Angelina College Lady Roadrunner softball players were feeling the least bit down after dropping the opener of the doubleheader with Navarro College, the team did not let those feelings linger for long. The Lady Runners bounced back from a tough loss early – Navarro rallied from 7-1 down to win 10-7 and to take a 9-2 win in the nightcap. the lead after a sacrifice fly from Nikki Whitehead and an RBI double from Jessica Husband tied the game at 2-2.Luker held Navarro scoreless during the next five innings as AC padded its lead.Nikki Gonzales sent home a run with a safety squeeze as part of a six-run fourth inning. Sydney Brown tacked on the final run with an RBI single in the sixth.In the opener, Lady Runner Kiriany Hornberger led off the first inning with a solo homer, and Rachel Agnello singled for an RBI as part of a four-run frame. Agnello added a two-run shot in the fourth, and the Lady Roadrunners led 7-2 after four innings.Navarro answered with five runs in the fifth and three more in the seventh to take a 10-7 win. Angelina College’s Emilee Cernosek follows through on her second homer of the softball doubleheader against Trinity Valley Community College Wednesday, March 21. Cernosek homered in each game, leading the Lady Roadrunners to a 16-4, 9-0 sweep at Roadrunner Complex. The Lady Roadrunner softball team members start off strong as they gather at home plate to celebrate being Kaylee Ancelot’s double home run during their second game of a doubleheader on Wednesday, April 3. Coach Mark Mattson’s strategy of changing the pitching staff worked to near-perfection on Tuesday, April 2 with Kaylee Ancelot tossing 13 consecutive scoreless innings and Kacy Capps providing a save. That left Shelby Mixon and McKenna Fryar fresh for Wednesday’s key conference matchup with Navarro College, and the circle duo paid dividends in AC’s 5-3, 5-3 sweep of the Lady Bulldogs Wednesday, April 3 at the Larry Phillips Family Sports Complex. AC battled back from a 2-0 deficit in the opener, tying the game in the third inning on RBIs from Riley Garrett and Rachel Agnello. 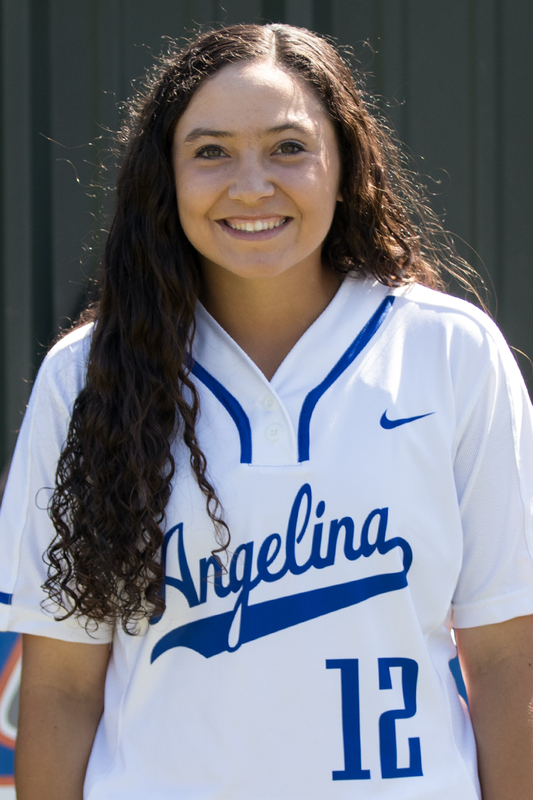 Navarro reclaimed the lead in the sixth on a pinch-hit double from former Central Lady Bulldog Carmen Acosta, but the Lady Runners answered with a three-run sixth inning behind RBI singles from Ancelot and Brette Kohring and a sacrifice fly from Garrett. Ancelot launched a two-run homer in the first inning to stake AC to a 2-0 lead in the nightcap. Agnello drove in a run in the second, and Emilee Cernosek doubled home a run in the third – she would later score on an error – to put the Lady Roadrunners on top 5-0. A two-run homer from Navarro’s Jenna Rude and a solo homer from teammate Sarah Koeppen trimmed AC’s lead to two runs at 5-3, but Fryar settled in afterward, allowing no more than a bunt single from another former Central High School player, Jarynn Sprinkle, before closing out her complete-game win. Fryar finished with six strikeouts, raising her total to 94 for the season. Mixon’s win in Game 1 pushed her season record to 9-1. The Lady Roadrunners with a season record of 24-6 and a district record of 9-3 are winners of eight straight games. Angelina College center fielder Tristin Anders makes an over-the-shoulder catch near the wall during the doubleheader Sunday, March 31 against Northeast Texas Community College. The 17th-ranked Lady Roadrunners swept the Lady Eagles 8-3 and 14-4 at the Larry Phillips Family Sports Comeplex. 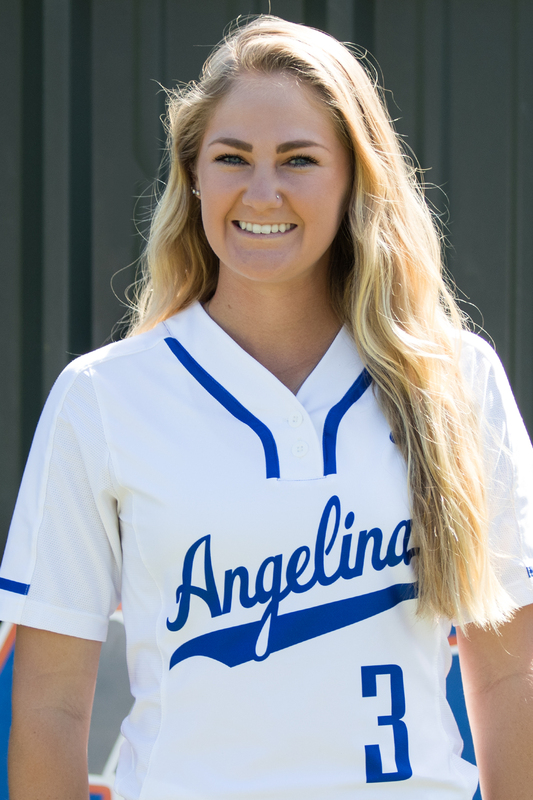 Angelina College’s 17th-ranked Lady Roadrunner softball team practiced patience at the plate, moving runners station-to-station until the big bats came alive to sweep Northeast Texas Community College 8-3 and 14-4 Sunday, March 31 at the Larry Phillips Family Sports Complex. The Lady Runners spent most of the first game trying to solve Lady Eagle pitching, scratching out runs on Cernosek’s RBI single in the first inning and Tristin Anders’ RBI double and sacrifice flies from Ancelot and Cernosek in the third. The 4-2 AC lead held up through the fifth inning when Garrett blasted a long three-run homer following Anders’ second RBI double of the game. Lady Runner pitcher Shelby Mixon finished with a complete-game win, pushing her season record to 8-1. AC hitters were just as patient in the nightcap but were able to jump out to a quicker start thanks to Cernosek’s three-run bomb in the bottom of the first. NTCC took a 4-3 lead in the fifth, only to have AC’s Ancelot put the Lady Runners back on top with a three-run blast in the bottom of the frame. Garrett cleared the scoreboard in right field with a two-run shot in the top of the sixth, and Cernosek walked it off with a three-run homer for the final 14-4 margin of victory. The Lady Roadrunners stand at 20-6 for the season and 7-3 in district games.